If you're a fan of the cream-filled candies you can buy in chocolate shops, then you'll love these Raspberry Creams! They start with pre-made fondant (homemade or store bought) so they're fast to make, and they're deliciously soft and creamy. You can roll them in nuts or dip them in chocolate, but when I'm in the mood for instant gratification, I just roll them in a bit of powdered sugar and eat them plain! You can use purchased fondant to make these creams, but I always prefer homemade fondant when possible. It just tastes better! 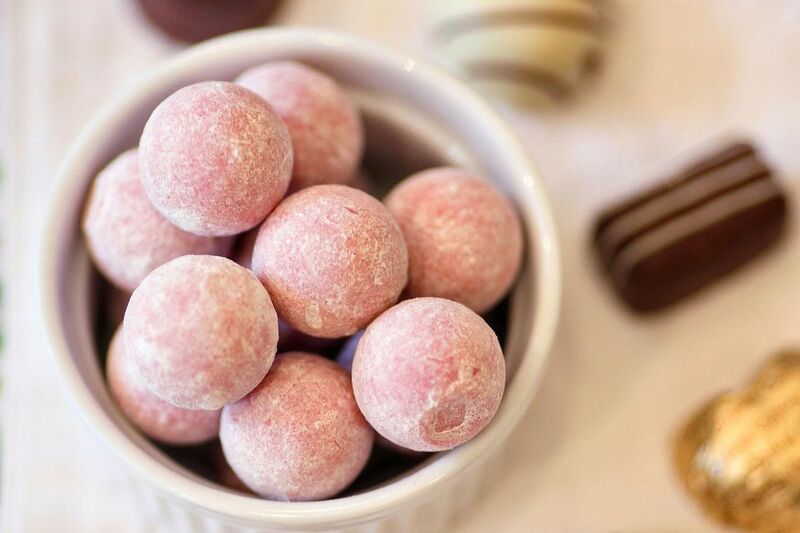 Raspberry creams can be rolled in chopped nuts, or dipped in chocolate or melted fondant. Try Basic Fondant or Marshmallow Fondant to get you started. 1. Place the jam in a small saucepan over very low heat, and cook it, stirring often, until it reduces to about 1/4 cup. The goal is to cook out the excess moisture, so that the creams will not be too moist and sticky. Once the jam is reduced, remove it from the heat and allow it to cool to room temperature. 2. Dust your workstation and your hands with powdered sugar. Knead the fondant until it is soft and pliable. Roll it until it is about an inch thick, and cut several slits in the fondant. 3. Pour the jam, lemon juice and a drop or two of food coloring into the fondant, and sprinkle the powdered sugar over the top. Knead until the ingredients and color are evenly distributed throughout. 4. Pinch off small sections of fondant, and roll them into a ball between your palms. If you'd like, roll them in powdered sugar or chopped nuts. If you want to dip them in chocolate, place the creams on a baking sheet to set for a few hours, until they develop a skin, before you dip them in chocolate.